Everyone likes to smile, but sometimes challenges in life can make it difficult to remain positive and smile. I’ve found that smiling during adversity can actually help and make you feel lighter and brighter. 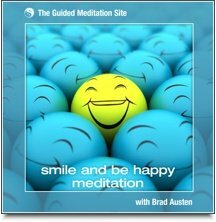 This guided meditation is designed to help you with that – smile more often and enjoy your life. This is a fairly simple meditation, which also helps you to open your heart and become more heart-centered. Often in life, our heart can partly close to protect you from being hurt over again and again. However part of our earth journey is to feel and express emotions, a full spectrum of emotional states. This can be part of what makes being a human being challenging at times. I recommend practicing this guided meditation a couple times a week. You may find that you naturally start to smile more often and begin to feel more positive about your life. This meditation is best practiced when you won't be disturbed for about 15 minutes, sitting comfortably in your home. As with all meditation, do not listen while driving or operating machinery. I sincerely hope your enjoy this smile meditation. A brief introduction about the smile meditation, which outlines some of the benefits of smiling to boost mood and wellbeing. This smile meditation begins with some breathing exercises, helping you to relax any tense muscles in your body. I then guide you to smile into each part of your body to aid relaxation and wellbeing. The focus then is placed on your heart chakra, allowing it to gradually open and expand with pink and green light. Lastly, some positive affirmations are suggested to help you smile and be happy.